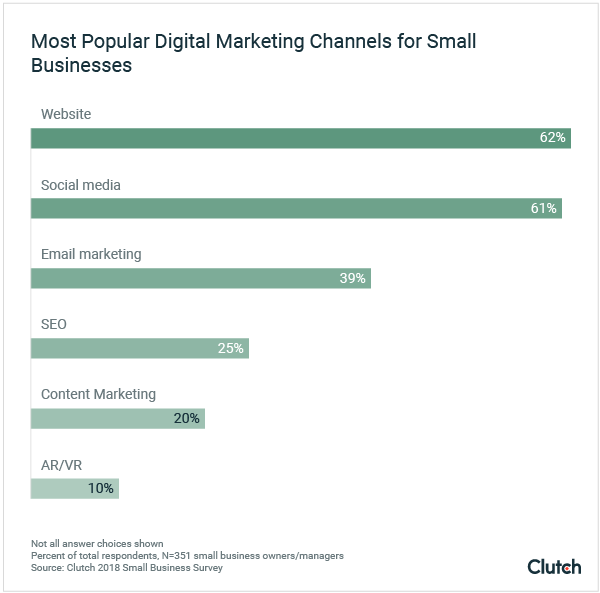 In 2018, small businesses will conduct digital marketing via their websites, social media, email campaigns, and more, according to Clutch's 2018 Small Business Survey. Here are some tips for turning a small digital marketing budget into real customer engagement. 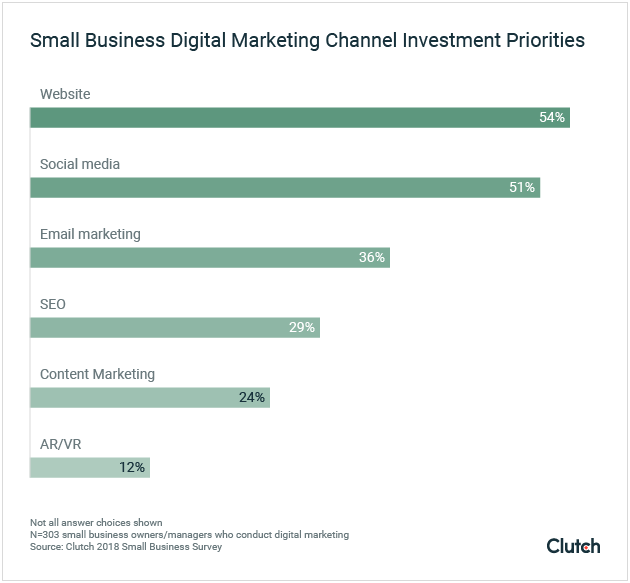 Clutch’s 2018 Small Business Survey examines the state of digital marketing. 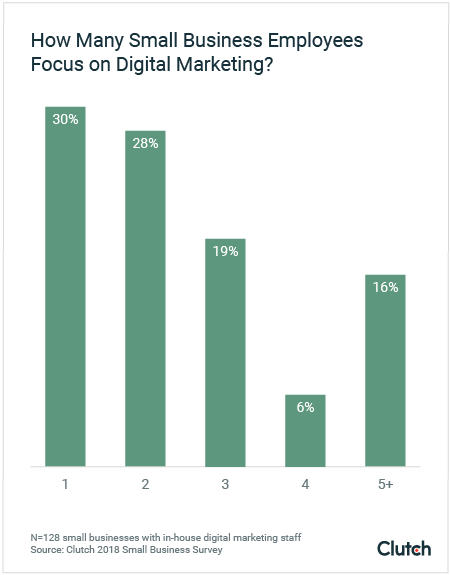 In this article, we’ll use the survey’s findings to explain how small businesses can invest in the top digital marketing channels and discuss how to optimize an in-house digital marketing team. Most small businesses (47%) spend less than $10,000 on digital marketing, indicating that they have small or nonexistent budgets. 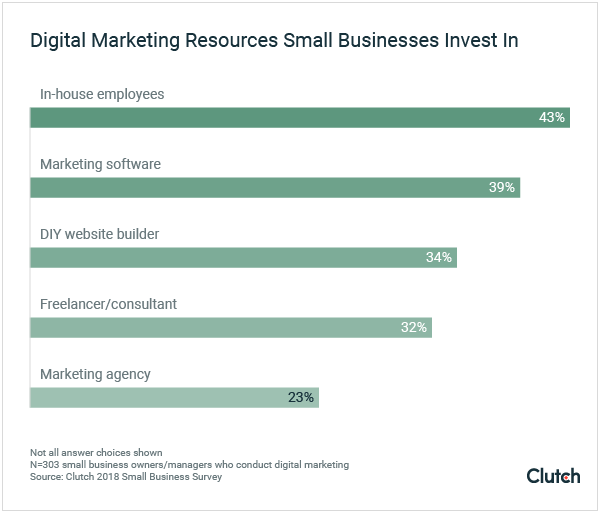 In-house help is the most common digital marketing resource (43%), but industry leaders say that small businesses that try to handle everything in-house may overextend themselves. Augmented and virtual reality are the least common forms of small business digital marketing (only 10%), but AR/VR can be highly effective for some small businesses. Small businesses can use this article to refine their marketing plans for 2018. Many small businesses set aside a small amount of money ($10,000 or less) for digital marketing. What money they do use tends to go toward social media, a website, and email marketing. In 2017, nearly half of small businesses spent $10,000 or less on digital marketing. 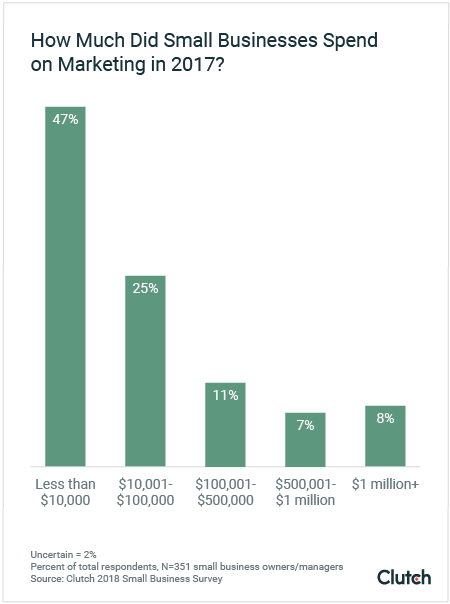 Only a quarter spent between $10,001 and $100,000 on digital marketing, and a minority (13%) spent upwards of $500,000. This is likely because most small businesses, termed "everyday businesses" by Janet Attard, are very small, with 10 or fewer employees. These businesses generate a small amount of revenue and therefore don't have much money to put toward marketing. Despite their limited budgets, the majority of small businesses engage in digital marketing. Well over half of all small businesses currently market through their website (62%) and social media (61%). Email marketing, at 39%, is another common marketing channel. The popularity of these three marketing channels, as well as the perennial discussions of SEO, content marketing, and AR/VR marketing, show that small businesses have a vested interest in understanding the digital marketing landscape. Many businesses know this, which is why more than half plan to increase the resources they apply to their websites and social media in 2018. However, small businesses don't always optimize their resources for ideal digital marketing execution. The days when digital marketing could be tossed to an intern or young relative are decidedly over. Now, it’s important for small businesses to invest in in-house staff who are familiar with marketing software, capable of creating effective content, and accustomed to monitoring the latest digital marketing trends. The most common digital marketing resource that small businesses use is an in-house team. Nearly half of small businesses (43%) rely primarily on their employees to plan and execute their digital marketing. When small businesses keep their marketing in-house, they have a consistent source of digital marketing support from employees who are already familiar with the company’s brand. However, it’s crucial that small business owners understand the benefits and drawbacks of an in-house digital marketing team. Since 55% of survey respondents have 10 employees or fewer, these in-house teams are likely small and may lack resources or access to professional development opportunities. In-house digital marketing employees may also be expected to shoulder digital marketing responsibilities in addition to other, related jobs, such as traditional marketing, public relations, or sales. In fact, that ‘team’ may be just a solo worker: About a third (30%) of businesses with in-house digital marketing staff only have one employee dedicating time to the task. To make the most out of an in-house digital marketing team, small businesses should hire digital marketing staff with focus and intention, says Devon Kirk, director of sales, marketing, and public relations at GetPayroll. She recently hired an assistant to help with digital marketing efforts. When Kirk first started at GetPayroll, she and one assistant handled every digital marketing task, from website redesign to social media marketing. However, when Kirk had the opportunity to hire a new assistant, she knew that she wanted someone with video production skills. “Digital marketing features video heavily now, so it was important to me to incorporate that into our marketing efforts,” Kirk said. "Digital marketing features video heavily now." Now, Kirk and her new assistant are creating a weekly video series, expanding GetPayroll’s YouTube channel, and working on a podcast. Though Kirk and her assistant comprise a two-person team, Kirk has been able to grow GetPayroll’s content offers by zeroing in on specific skills. When evaluating their in-house digital marketing staff, small businesses should hire strategically to ensure their team has the knowledge to adapt to a changing digital ecosystem. No matter how many people a small business dedicates to digital marketing, they should consider investing in digital marketing software. Digital marketing software reduces the time it takes for marketing staff to reach out to potential customers, generate, leads, and build lasting relationships by automating part or all of these processes. Hubspot, for example, helps companies find the best leads and communicate efficiently with them by creating contact and company records. Marketing software is the second-most popular digital marketing resource, with 39% of small businesses using software to support their digital marketing efforts. CRM automation software helps businesses track all the people they contact, including customers, vendors, and leads. This ensures that leads don’t fall through the cracks. CRM software also allows businesses to automate certain time-consuming correspondence, such as cold outreach. Businesses then have an organized system for reaching out, which saves time and money. Examples of CRM software include HubSpot and Salesforce. Analytics software lets companies know who is visiting their website, for how long, and what users do while looking through a website’s pages. Analytics tools help small businesses learn about their current audience so they tailor website content. Some of the best analytics software includes Google Analytics, which is free. Moz and Hotjar offer both free and premium versions. Investing in websites, social media, and email marketing are the most popular. Less than a fourth (24%) of companies plan on investing in content marketing, but since content marketing boosts SEO for little cost, experts say this is a mistake. In addition, some forward-thinking small businesses plan to invest in AR/VR marketing. We’ll use survey data to examine these digital marketing channels and suggest strategies for how small businesses can use each channel effectively. A business’s website is the main way it communicates its products and services to the world. Many small businesses know this: The majority already have websites and are increasing their website investments in 2018. Additionally, more than half (54%) of small businesses plan to invest in improving their websites this year. This is a smart marketing move: In 2018, a website is the first stop for prospective buyers who want to learn what a business has to offer. Additionally, e-commerce is gaining importance. Business Insider reports that e-commerce will make up a forecasted 17% of all retail sales in the U.S. by 2022. “We live in a world where people Google before they shop, visit online review sites before they buy, and check in via Facebook as they go about their days,” writes Nicole Leinbach-Reyhle for Forbes. Whether a small business sells handmade linens, offers landscaping services, or develops mobile apps for clients, a website is an opportunity for prospective buyers to learn what that business has to offer. A good small business website should have an attractive design, clearly present the company’s services or goods, and load quickly. 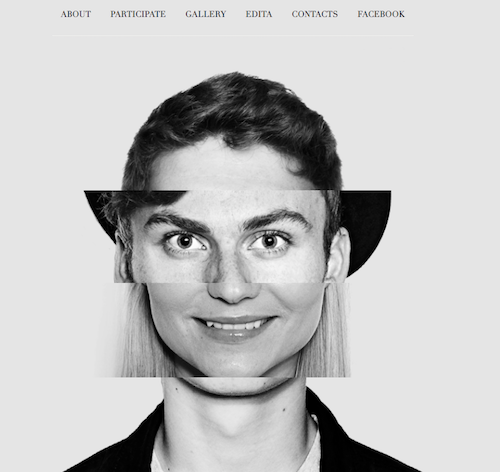 Edita's Casting is a small, family-owned talent agency with an eye-catching website. Its front page scrolls through continuously changing sections of the company's actors' and dancers' faces. The company shows off its main asset – a host of diverse, personable talent – and includes clear buttons at the top of its minimalist homepage. Virtually all small businesses benefit from building a website that can help prospective customers learn more about their brands. Our survey found that content marketing is one of the most underused digital marketing channels. Content marketing encompasses all of the content a small business produces, including blog posts, whitepapers, ebooks, videos, and more. However, few small businesses make use of content marketing. Four-fifths (80%) of these companies do not engage in content marketing as a digital marketing strategy. In fact, content marketing is one of the least popular marketing strategies. The only marketing channel that’s less popular is AR/VR marketing, which is an emerging technology. The worth of content marketing, however, is proven, and it should be a tool in any small business’s toolkits. Despite its lack of popularity, content marketing remains one of the best ways for small businesses to define their brands and improve their websites' SEO. Content marketing helps to improve SEO by allowing businesses to target keywords, improve search ranking, and provide helpful content to current and potential customers. For example, if a small software development company wants to rank for local search results about development companies in Boston, a team member could write a blog post about the history of software development in Boston and why it’s a great place for quality development teams to flourish. The post could mention strategic keywords that help the company rank for industry terms and phrases. In the end, companies become more visible to their target audiences by providing useful, entertaining information. Though content marketing is a highly cost-effective digital marketing strategy, it isn’t easy. That’s probably why so few small businesses engage in content marketing or plan to invest in the activity in 2018. According to Demand Metric, content marketing is 62% less expensive than traditional marketing and advertising but generates three times more leads. Small businesses can harness the power of content marketing to reach more people at a fraction of the cost. However, regularly creating and publishing blog posts, white papers, ebooks, and infographics requires time, writing talent, and knowledge of a business’ brand and strategy. Brainstorm a unique contribution. What information can your business offer that no one else can? This could be a case study of an innovative project, insight into how a product is crafted, or suggestions for how customers can apply products or services in their lives. Define your content marketing goals. Are you aiming to improve your ranking for certain keywords, build your brand, or both? Have you thought about how many qualified leads you need to reach your growth goals? Consider the various types of content available (articles, videos, podcasts, infographics). What kind of content is your business already suited to create? Create a content schedule. How often will you produce content? Define content creation and publication responsibilities. Who is in charge of what? Above all, make sure that the content you create is helpful and insightful. Keith Gutierrez is the VP of Inbound Growth at Modgility, a Cleveland marketing agency. He helps companies create and execute content marketing strategies. “We focus on creating in-depth articles that give people step-by-step instructions or share a specific story about how somebody was able to solve a business problem. That’s where we find a lot of success,” said Gutierrez. For an in-depth guide to content marketing, read our complete guide to content marketing for SEO. Social media is an essential part of any small business’s marketing strategy. This makes sense: Basic social media outreach is a free way to reach potential customers. Three out of 5 small businesses (61%) use social media marketing to market their brand. According to research by Texas Tech University, companies that use social media marketing effectively are more likely to cultivate brand loyalty. More than half of small businesses (51%) plan to invest more in social media marketing in 2018. Since so many businesses focus on social media, it’s important that both those businesses and their digital marketing partners understand how to engage with customers effectively. “Social media is really about having a conversation. A lot of people get social media wrong because they just broadcast their business. But to be effective, you have to engage in conversations with people,” Gutierrez said. For example, the American restaurant chain Denny’s Diner created a Tumblr profile to connect with a young, Internet-savvy demographic. 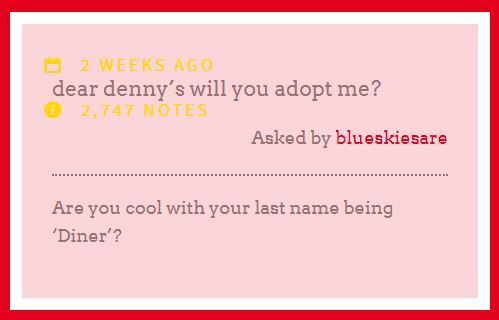 Other Tumblr users can ask the Denny’s profile questions, which Denny’s frequently answers. By excelling at a funny, yet warm tone, Denny’s has become famous for its social media presence. When businesses engage directly with customers, they can better understand what customers want. To facilitate those conversations over social media, businesses should look for tools that give them opportunities to connect. Social listening software lets companies know when Internet users mention them, even without hashtags. When businesses take charge of their social media presence by engaging with users and trying social listening tools, they leave a positive impression on potential customers. To maintain a social media presence, small businesses should consider making a social media calendar. Ciunci recommends tools like Hootsuite for small businesses that struggle to post regularly. Hootsuite allows companies to schedule tweets and Facebook posts in bulk, which alleviates the stress of daily social media planning. 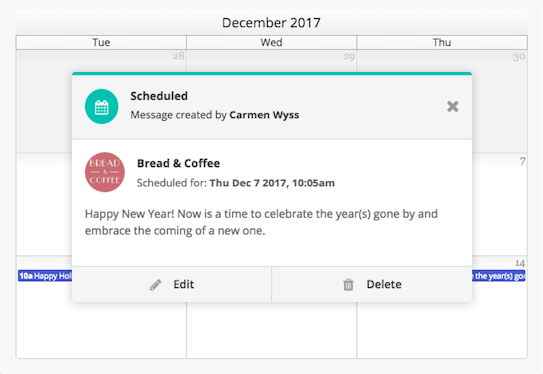 Since the majority of small businesses with in-house staff only have one employee, that employee can make better use of her time by planning a calendar in advance. Most social media scheduling tools provide metrics tracking. Businesses can see which posts garner the most engagement and try to replicate that success. For more recommendations about how small businesses can manage their social media presence, including more granular data about specific social media platforms, read our small business social media survey. Augmented reality (AR) and virtual reality (VR) marketing take advantage of cutting-edge technology to let consumers get close to a product. They can try the product without actually buying anything or even being in the same room. AR/VR marketing is not yet mainstream among small businesses: Only 10% engage in AR/VR digital marketing. However, that number more than doubles (21%) for small businesses with 50 or more employees. 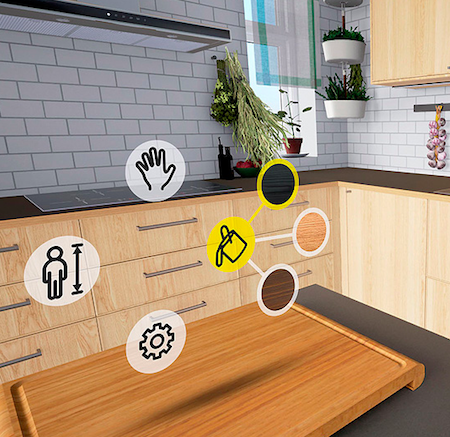 For example, IKEA’s VR app allows consumers the chance to position furniture in their homes. Since furniture is bulky and expensive, it’s difficult to ‘try out’ the same way someone might try out, then return, a pair of pants. Apps like IKEA’s are a major part of circumventing that problem. Business owners in certain industries have figured out how to leverage AR/VR marketing to show off their products. 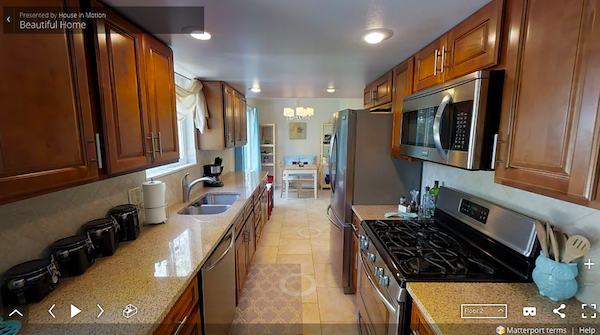 For example, Derrick Bozkurt, a Colorado realtor at House in Motion, began using VR in 2016 to create virtual house tours. “A big challenge in real estate is inaccurate property descriptions. We’ll drive to a property and within seconds, clients say it’s not what they expected,” Bozkurt said. For several years, he’s been working on a VR solution to eliminate the problems caused by inaccurate listings. “We’ll go out and shoot properties with virtual reality or 360-degree video so that prospective buyers can experience them remotely,” Bozkurt explained. Clients can explore properties through online portals, like the one below. VR marketing lets Bozkurt’s clients know exactly what kind of home they’re considering, which is why the technology gives him a competitive edge. As AR and VR solutions become more affordable and flexible, businesses can look to the technology as a way to give customers an accurate impression of products. Email marketing, when done well, allows a company to develop deeper relationships with consumers. Two-fifths (40%) of small businesses use email marketing to reach their consumers, which makes it the third-most popular digital marketing channel. That number lags far behind websites (62%) and social media (61%). Small businesses that don’t use email marketing are missing a key opportunity to connect with the people most invested in their products. A comprehensive email marketing strategy might include a weekly or monthly newsletter with relevant articles and a new product roundup, as well as eye-catching copy on basic emails like sales confirmations. For example, TopatoCo, an e-commerce platform for independent creators, showcases its creativity in shipment tracking emails. This one has the subject line "Someone's about to get a package from TopatoCo!" The care TopatoCo's sales and marketing team take in writing email copy is obvious. It's funny, short, and informative, and it makes customers want to buy from the company again. Additionally, small businesses should create segmented email lists to engage the members of their audience most likely to make a purchase, open an email, or spend time on a website. 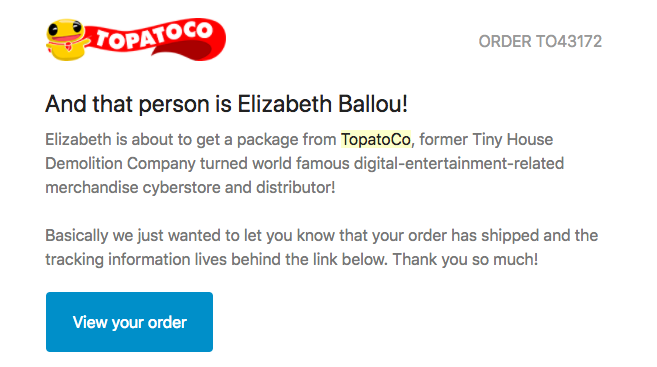 For example, TopatoCo could create a list of every customer who opened the shipment emails like the one above, then send a coupon to these customers as a reward for being engaged email readers. Email automation technology allows the smallest of businesses to send personalized messages to multiple customer groups. "Marketing automation is exploding right now," says Ciunci. "I would start with MailChimp, or a more sophisticated platform like HubSpot or Marketo." Automation is essential because it saves time for small marketing teams. Whatever a business's email marketing strategy, they should incorporate their personality in emails. It may seem like many digital marketing channels and efforts, from SEO to marketing software to email campaigns, are too expensive or time-intensive to work well for small businesses. However, digital marketing is necessary. It provides a crucial bridge between small businesses and their audiences. When small businesses are intentional about delegating digital marketing tasks and hiring for specific digital roles, they can make the most of a small budget and an in-house team. Companies' websites and social media presences are popular places to start, but email marketing and content marketing also provide low-cost, high-reward opportunities to connect with consumers. AR/VR marketing is an ideal option for small businesses that want to give consumers a sense of immediacy. Ultimately, digital marketing provides a way for small businesses to distinguish themselves in an increasingly chaotic digital sphere. Clutch surveyed 351 small business owners or managers from across the U.S. with fewer than 500 employees. About 40% of the small businesses owners surveyed are aged 18 to 34; 40% are 35 to 54; 19% are 55 and older. About 54% of survey respondents are female, and 46% are male. Learn the key marketing and advertising strategies that 305 small businesses use to succeed. Read detailed client reviews of digital marketing agencies to find the best provider for your business.